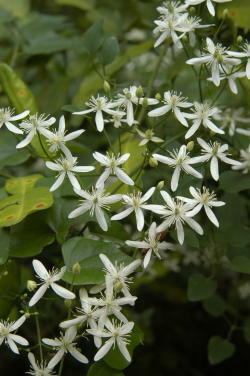 HABIT: Vigorous semi-evergreen climbing vine with profusion of fragrant 1” white flowers in the late summer. Correct botanical name is C. maximowicziana. Also called sweet autumn clematis. Native to Japan. C. x jackmanii also does pretty well here in filtered light. Scarlet clematis, C. texensis is native and has small unusual red flowers. Clematis texensis (scarlet clematis) is native and has small unusual red flowers. Clematis pitcheri is the purple flowering native. This information comes from Howard's new book Texas Gardening - The Natural Way click here to purchase.